Heat enough oil to reach 1” in a heavy bottomed skillet or casserole, set over medium heat, for at least 5 minutes. Test the oil with a tortilla piece, once the oil is actively bubbling around the tortilla, it is ready. Add a batch of the cut tortillas without overcrowding the pan; they shouldn’t be on top of each other. Fry for 2 to 3 minutes, until they crisp up and achieve a golden color (don’t let them brown or they will burn). Remove with a slotted spoon or spider and place on a plate covered with paper towels to drain. Immediately sprinkle on salt to taste and continue with the rest of the tortilla pieces in batches until done. Reserve the frying oil. Place the chiles, garlic and tomatoes in a saucepan, cover with water and set over medium-high heat. Simmer for 10 minutes, until the tomatoes are cooked and mushy, and the chiles are rehydrated. Place the cooked chiles, garlic and tomatoes into the jar of a blender, along with ½ cup of their cooking liquid, the cilantro, and salt, and puree until completely smooth. In an extended skillet or casserole, heat 1 tablespoon of the oil from frying the tortilla pieces and set over medium heat. Once hot, add all the tortilla chips and let them reheat for a minute or two. Pour in the beaten eggs, and once they begin to set, add the guajillo salsa. Gently begin to fold until everything is covered with the salsa, and the eggs are cooked, just a couple minutes. Remove from the heat, top with scallions, cilantro and avocado. Serve. Loved watching this show; I want to make this recipe but what can I substitute in place of the eggs.? Oh you can leave them out Vijaya…or experiment with your favorite meat substitute and let me know how it goes! I’m so happy you got over your fear and are enjoying the chips and migas, Miguel! More are on the way Poncho…and say hi to your wife for me. These look great. My sister in law makes a similar dish with a chile de árbol salsa. She calls them chilequiles. 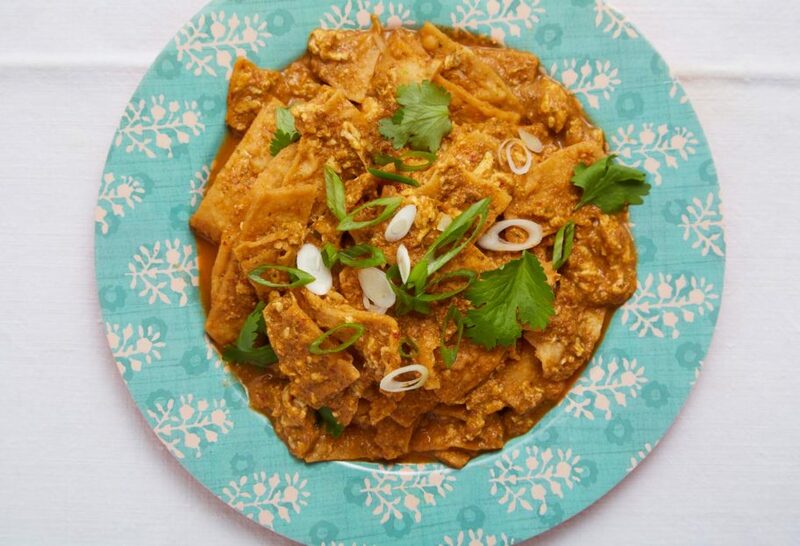 What is the difference between migas and chilaquiles? Oh that’s a great question, Tina! They are similar…but chilaquiles have the crispy tortillas chips bathed in the sauce and sometimes topped with a sunny side up egg. And migas are tortilla chips that are cooked in the sauce and scrambled eggs. Saw this episode a few weeks ago and had a chance to make them today. Didn’t feel like frying my own chips, so I heated up some store bought, thick tortilla chips from the local Mexican grocery store in my oven. Then just followed the recipe. Came out awesome and so easy to make! Thanks for the great recipe, Pati. Love your show! So glad you enjoyed the migas, Ron. Pati, I watched this yesterday and can’t wait to make it at home. You are just the best! Gracias! Oh thank you Melanie! Have fun in the kitchen. Pati I love your show your receips! Pati Me encantan tus recetas. Keep them coming !!! Si no fuera por usted no comeríamos nada ! Muchas gracias !!! Eres la mejor chef en el mundo y tus hijos y esposo tienen mucha suerte.